My specimen of Hoya lanceolata bella White came as a very tiny rooted 3 inch cutting. It came from Torill Nyhuus, Chairwoman and editor of the Swedish Hoya Society. The cutting was obtained for me by my very good friend Julie Kennedy of the UK. At first everything went along swimmingly with my little plant. It was growing along nicely through most of the winter months in a basement grow tent. My little 3 inch plant grew to around 16 inches and stopped. For the next 2-3 months it grew not at all. I finally suspected a compromised root system and after inspection, I did indeed rot the roots. After I discovered that the roots were gone on the plant, I thought why not turn lemons into lemonade and cut the plant up into tiny two inch pieces and not only get a fuller plant, but maybe have some to sell. I ended up with two 4 inch pots and a two inch pot of cuttings. Meanwhile Julie Kennedy had lost her little 3 inch plant that she had purchased with me so I sent Julie one of my 4 inch pots full of cuttings, because I thought that I had plenty. Right after sending Julie one of the pots of Hoya lanceolata bella White, my cuttings started to go downhill very quickly. They began yellowing and the leaves began to drop off. I took the pots out of my grow tent and put them directly outside where it would be cooler. Nothing helped, and they continued to spiral downward. 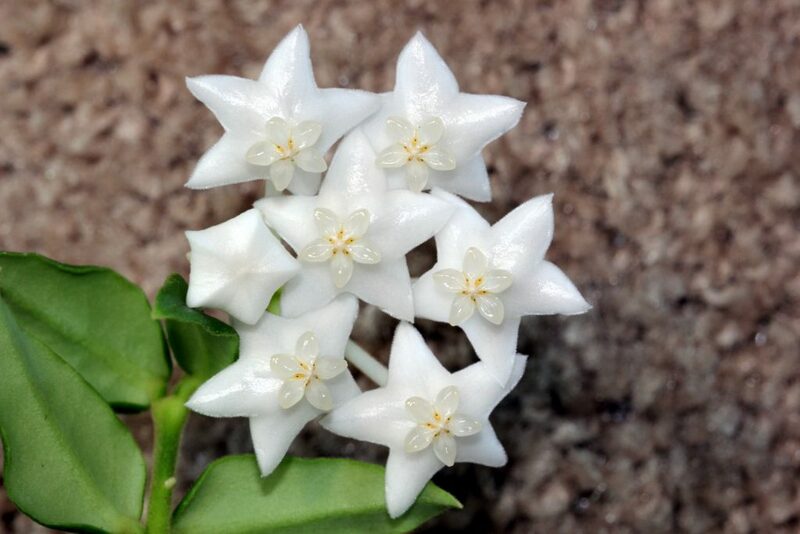 Throughout the spring and summer of this year (2016) my tiny, two cutting, Hoya lanceolata bella White continued to grow until I had one piece around 14 inches long and another piece about 5 inches long. I no longer feared losing the plant, and the longest cutting started to form a peduncle. I did not get too excited about it at first as I had seen many very tiny peduncles abort in the past. This peduncle however was different and not only hung on, but started to grow! I watched it daily for weeks and finally was rewarded with very beautiful flowers. I am sure that it is only a matter of time before Hoya lanceolata bella White or as I like to call it the Ghost Bella becomes more widely available. Its care is very similar to the standard Hoya bella except I think that it can take slightly warmer temperatures, as this one grew and flowered in a very warm and humid grow tent. I dont know what the future of this plant is with me; I would like to take cuttings to get a fuller plant, but after my bad luck the last time, I am afraid at this point to cut it. I hope to report back on this plant in the months and years ahead. A big thank you to Christina Karlsson of Sweden for digging into my question about where the white Bella came from and getting the answers. Also, a thank you to Julie Kennedy for contacting Christina in the first place. The collection number was assigned by Surisa Somadee, and the PES03 comes from the name of the collector Dr. Piyakaset Ek Suksathan. This is the same collector who found Hoya lithophytica formally known as Hoya sp. Umphang PES01. The plant was likely collected in Thailand and given to Surisa in 2007. The fact that there is so little of this wonderful plant in the trade after 11 years, I think, is a testament to the difficulty in its propagation.